You might have already heard, but it’s worth a reminder that time is running out to see Ron Mueck's solo exhibition of eleven extraordinary works at the Brooklyn Museum through 4 February 2007. Known for his empathetic renderings, the sculptures are startingly lifelike—so much so that it was easier to look at the sculptures that had their eyes closed, because only then could you feel unhibitited in your observation, sympathy and admiration. 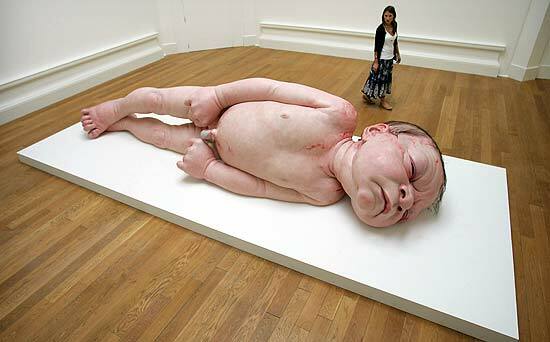 Mueck’s attention to detail is excrutiating. Take notice of the subtle translucent skin revealing veins on the lower back of the 15 foot (4.5m) long piece called "A Girl". Also, be sure to catch the video showing his sculpting processes. Prior to this visit I had only seen his work in photos and books—there is no comparison to seeing it in person. The Brooklyn version of the exhibition travels next to the National Gallery of Canada, Ottawa, February-May 2007.